Northampton Town's Adebayo Akinfenwa says the team's success is more important than his own starting place. The 30-year-old has made three starts in 2012-13 while Clive Platt has been in the starting line-up seven times. 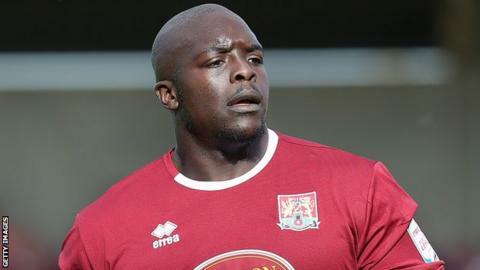 Akinfenwa, who scored against Dagenham and Redbridge, told BBC Northampton: "A footballer who says they don't want to start games is in the wrong job. "But the gaffer picks the team. I'm pleased with my contribution but it was a team performance." Striker Akinfenwa, who was linked with a possible move away from Sixfields in May, added: "Football is about opinions. Sometimes we're going to like it and sometimes we're not. "I'm taking nothing for granted. If I start [against Chesterfield on Saturday], I'll try to put in the same performance. If I'm on the bench, I'll try to come on. "When you get the opportunity, you've got to try to do enough to start the next game. "But the bottom line is that the three points were the main thing and now we go into a home match. "We're unbeaten at home and if we can get six points then we'll have had a nice week."